Videos are no longer an up and coming trend. Your audience expects you to incorporate engaging video content into your online course material. The only problem is that hosting video content on your own server can quickly take up a lot of space and other server resources. 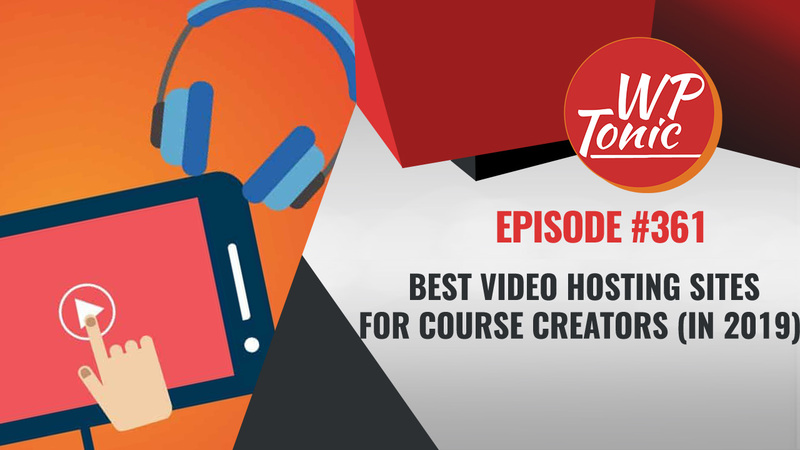 With this in mind, in this post, we’ll run the rule over some of the best video hosting sites for course creators and list out the pros and cons to help you make an informed decision. Jonathon: Welcome back folks to the WP Tonic Show. This is episode 361. It’s going to be a discussion between me and Cindy. And we are going to be talking about the best video hosting providers for 2019. That’s what we’re going to be discussing folks. And first of all, I’m going to introduce you to my cohost. That`s Cindy. Cindy, like to introduce yourself to the new listeners and viewers? Cindy: Sure. Hi everyone. Thanks Jonathan, Cindy Nicholson here. I help people create online courses. And you can find me at the coursewhisperer.com. Jonathon: Yes, and she’s a great co-host. So this is one of our most popular posts in 2018 folks. So we’re going to be doing a rewrite in the next couple of weeks where we are going to be coming back to this subject and see if things have changed. 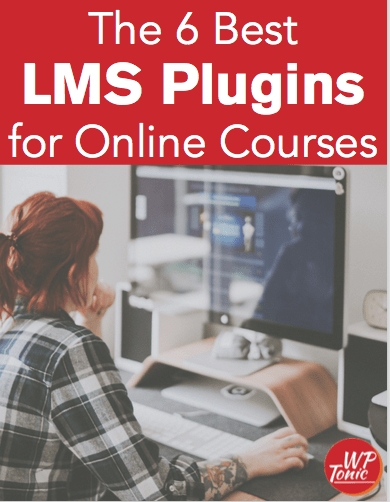 So just to give a broad description of this is that fundamentally you don’t want to host your videos for your course, for your eLearning membership site on your hosting. Especially shared hosting. Or hosting in general. There is normally bandwidth limits on any kind of hosting. Or it’s based on either bandwidth or visits to site. There’s different metrics and when you go over that metrics, either your hosting gets suspended or you get quite the shock of an extra bill. It’s just not a good idea to host your videos on your normal hosting plan. And also you don’t, depending on the course, you probably on the paid courses, you don’t want your videos to be accessible to people that aren`t paying for the course. And there are other feature sets that you might be looking for. Now you could say that you can make your YouTube videos private. But if that URL gets found out somehow they can be viewed where the services that we’re going to be discussing during this show, that won’t happen. How does that sound Cindy? Cindy: This is definitely something that you have to figure out if you’re going to create a course or membership site. Like who is going to host your videos. So it’ll be a good insight from you, Jonathan, just based on what your experiences. And what people need to be looking for when they choose their video host. Jonathon: So let’s start. Let`s start with YouTube. I mentioned them in the introduction. I think YouTube is fantastic. We push all the interviews and our internal discussions, me and Cindy onto the WP Tonic YouTube channel. Please go there and subscribe to the channel. That really helps the show as well. And I’ll be putting up more video that’s not part of the normal routine of the actual interviews onto the channel in 2019. That it’s great. That gets one point for being active users. It’s a great education. Literally anytime I want to learn anything, I normally search YouTube to give me an introduction reviews. It’s powerful. They have a tendency to keep changing the interface almost every month. They do have a tendency to do that. I would say it’s great for promoting your course. For putting some video, putting value out there. So building up your audience before you do your membership course. And also as a way of promoting your course. I do not recommend it as the hosting provider for your actual course videos. Would you agree with that Cindy? Cindy: I would agree 100 percent. But your audience might wonder why you don’t recommend it for the actual hosting of your course. Jonathon: Well, because you can make the videos private, but if those URL`s in some way get found out. I understand there’s ways to find private videos on YouTube. And then they can be downloaded even though if you. There’s plugins for Chrome and Firefox that makes it possible to download the videos. Making that copyright content truly secure is not achievable in using YouTube Cindy. Cindy: Yeah, and as you say, I think it’s a great platform for marketing. Because it’s such a widely used nowadays. That’s a great way to market yourself, but not necessarily the actual delivery of your course content or your membership site. Jonathon: Onto number two. And I always struggle with the name. I’m going to struggle again. How do you pronounce it Cindy? Jonathon: Wistia. I always struggled with that. Great company, fun people to do business with. I would say they are kind of the bee’s knees of video hosting. It’s a pretty slick video hosting company. They offer a lot of functionality. They did offer a free plan. And I think they still do. But it`s quite limited the amount of videos you can upload on the free plan. And the jump they are quite expensive to be truthful about it. What do you get? You get a really slick interface. They are probably one of the best on the market. You get fantastic support and they do have a feature set which is really focused on e-learning and membership websites. You can like three minutes into the video. You can put an email gate. You could ask people to see the other part of the video. Can they give you their email? We should probably not of interest to a membership e-learning, but to marketers that`s of interests. Putting in links into the videos so they can link. So they can up-sells. You could add at the end of the video, you can put in a link and a commentary to go to a page for a up-sell. There’s a lot of functionality in built with them. But like I say it’s not cheap. You have any experience with them Cindy? Cindy: Yes I do and again, it’s usually the one that you hear of. Wistia or Vimeo probably are the two most popular ones, but they also have a lot of, like data metrics that you can track as well. This might be helpful when you are creating your course because if you can see where people end up dropping off of your videos, you can kind of really get some insight from that perspective in terms of the actual course itself. And their player is pretty slick as well isn`t it? Jonathon: Yeah, onto the next one Vimeo. I’ve got a Vimeo account. I’m going to be talking about two providers that I have. I typically use and Vimeo has been around, I think they’re based in Holland. They’ve been in this sector for long time. They offer a free account. A bit like the previous one, a bit limited. But they offer their pro account, which I think is around about $199.00 a year. And it’s one of the best value accounts that you get. I wouldn’t say their interface is as slick as Wistia. But they offer really good value. You can buy an extra storage if you need it. They make it really easy the interface. There are a number of inbuilt security features that they offer. I’m not going to list them all. I might bore you to tears listeners and viewers. And it’s a pretty slick interface. What was your experience with Vimeo? Cindy: No, no, I agree. It’s kind of almost like a stepping stone to Wistia. Because it’s a little bit more affordable for people who may be starting out with creating their courses relative to going with Wistia. Depending on how much content you have to provide. But it is, again helpful to kind of get those details that you’re looking for. In terms of the data. The data mining I think is really helpful for course creators. Jonathon: So you have actively used it yourself? Jonathon: Has there been any particular, any kind of frustrations or anything you thought am not too keen on? Cindy: Nothing that kind of jumps out at me right away. It’s just a learning curve with when you learn anything in terms of trying to figure out how to navigate. How to get around it. It’s kind of like learning a new language. You kind of have a really steep learning curve at the beginning. But once you get into it then there’s really simple to use. Jonathon: One thing I see with a lot people when they just start is you get in with both products that I have described. You have got a lot of control over what is shown in the actual player. One of the main things it might show is that the downloadable feature is not available. But there’s a lot like the title of the video. There’s a lot more finite controlled on the paid versions of both services that than what you would get with YouTube. You can also with the player. I think we both discussed, you can match the colors of your website with the player. But you can definitely, what is offered and what isn’t offered in the actual player a lot of control which you do not get with YouTube. Cindy: Just kind of what you’re looking for as you probably do want to have a little bit more of that flexibility when it comes to creating your courses. Because videos will probably be a big part of your actual course itself. So. Jonathon: It certainly is. We’re going to have our break folks and then we’re coming back. We’ll be delving more into some of the services. We will be back in a few moments. Announcer: Do you want to spend more time making money online? Then use WP Tonic as your trusted WordPress developer partner. They will keep your WordPress website secure and up-to-date so you can concentrate on the things that make you money. Examples of WP Tonic`s client services are, landing pages, page layouts, widgets, updates and modifications. WP Tonic is well known and trusted in the WordPress community. They stand behind their work with full, no questions asked. Thirty day money back guarantee. So don’t delay. Sign up with WP Tonic today. That`s wp-tonic.com. Just like the podcast. Jonathon: We’re coming back. We are talking about video. So before we go on, I want to talk about one of our great sponsors. And that will be WP Fusion. What is WP Fusion? Well it should be really part of your tech stack. Now, the two fundamentals that should be there anyway is WordPress in my opinion and a CRM. And a CRM enables you to do email and marketing automization bit like an active campaign drip. There are a number of them. And WP allows your WordPress website to really communicate on steroids with your CRM. And if you’ve got a membership website it’s really something. And you’ve got WordPress and you got a CRM. You really should look at getting WP Fusion. And it will enable you to tag things and send automated email and building funnels and marketing funnels. It`s just amazing. So go to the WP Fusion website. Have a look at some of the training videos and you will just be blown away. Plus if you buy any of their packages and use this coupon code wptonic ALL one word upper case. You’d get 25 percent of any of their packages and that’s exclusively only offered to the WP tonic listeners and viewers. And it’s just amazing. So onto our review. So we’re going to be revising the article that this episode is based on. And I was ticked about this particular surface by Adam from WP Crafter. He’s been using it for a number of years. And they offered a fantastic deal. So I thought I was given a great review and I was offered a great deal. And this is a company called Voo player. V o o p l a y e r Voo player. And I’ve been blown away with them. Really they’ve got amazing great analytics. The player is fantastic, great security, really interesting integration. And the price, they do offer a free account. And then the next one up is $14.00 if paid annually. I think it’s $19.00 if you pay monthly. And it’s frigging amazing. And I have been using it on my own, on the WP tonic and some other sites. And I think something you listeners and viewers should consider. Is this something that you’ve heard about before? Cindy: Only just through you Jonathan, since I’ve come on board, because I’ve heard you talk about Voo player before. So what do you think really differentiates itself from say Wistia or Vimeo in terms of why you like to work with them? Jonathon: I think because I haven’t delved into it as much as I can. But they’ve got some really cool features around when it comes to marketing and brand new control. Let`s say you have got a video and you’re trying to use that video to get more leads through email. So you can stop and ask for your name and email. So you can set up custom forms to do that. A lot of its functionality is Wistia. I think it compares to what they’ve got, but it’s cheaper. But a lot of the key marketing kind of functionality gradually throws over videos and that it offers. And the players really professional. They are some other players in this game. The actual player isn’t up to snuff really? But there’s professional looking and I’ve found that their service to be buggy either. Cindy: How long have they been around? Jonathon: They have been around. Because I don’t remember. After WP Crafter did a video in 2017. I think they’d been around for about two and a half years. What happened was that I think it was started off by some big marketing online marketing types. And this version when they started and then they found out they felt that their core product wasn’t. Trying to find the right word here. Wasn’t as competitive to the leading players as they hope. So they did a total rewrite which took over a year. And this is version two basically. But I think Adam’s been using them for over two years. And then we going to talk about our last one. Which is a Bright Cove and they’ve been around for quite a long time. Because of the 30 day free trial it seemed to be aimed at the pro level up to the very large. Because if you’ve got a very large membership website. And you’re playing a lot of video. They’re playing a lot of video. You’re going to end up being bumped into the higher accounts of all these people that we’ve mentioned. If you bumped up into the high one, you’re more into the kind of enterprise level. You then probably might get a better deal with looking at something like Bright Cove. But I know Voo player does an enterprise. I have an enterprise level account with the Vooplayer. Because we offer through Vooplayer. We offer our turnkey solution. We offer video hosting as part of it. And that’s with our partner Vooplayer. So they do offer enterprise level because I have got an enterprise level account with them. But Bright Cove is similar. They do seem to be aimed at the higher level. Because they don’t even list the price. You actually got to approach them and to get a price. And when you see that, you know that you’re dealing with an enterprise level, don’t you? Jonathon: So to wrap up Cindy, is there any kind of insights or tips that you’ve seen but we are working with clients around video? Cindy: Number one. I think it’s valuable to have video as part of your course. Some people have some reservations of being on video. And I think that’s an opportunity for another podcast to talk about how to overcome some of those challenges. But I think that it’s definitely the way to go in terms of making sure it’s part of your course. But I think it’s also part of your marketing strategy too is being on video. Because people will buy your course when it’s more, when they tend to know, like, and trust you. And the best way to kind of see that is by, through videos. So part and parcel of that is then choosing your host of who’s going to host all of these videos for you. Jonathon: Yea I also like to point out that recently me and Cindy did a great interview with Sean Cannell. He has a great YouTube channel. He’s a great guy basically. I really enjoyed him. If you get a great buzz from him. I think you did as well Cindy? Cindy: Yeah, absolutely. And yeah he got some good tips around that as well. Jonathon: His YouTube channel. He has got an extensive YouTube channel where it goes into what cameras, lighting, live video. It goes through all the things that you need to do to produce the videos. To then utilize one of these hosting companies. I’ll make sure to add a link to the interviews in the show notes. It was episode 337. And he’s got a book out as well, which he gave me a free copy. And which I was really chuffed to get. But he’s just a smashing guy and very professional, isn’t he?